ST. GEORGE — In the span of 10 minutes a car can heat up by 20 degrees, enough to kill a child left alone in a vehicle who is too young to alert others for help. Nationally, 51 children died from heatstroke in 2018, making it the deadliest year on record, according to information provided by the Utah Department of Public Safety. In Utah, there were 10 heatstroke-related deaths in 2018, up from nine children in 2017, which places it 28th among states. 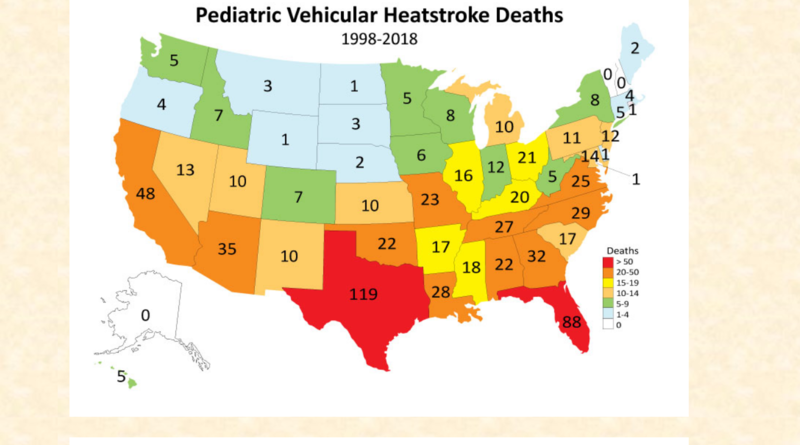 Heatstroke is one of the leading causes of non-crash-related fatalities among children, National Highway Transportation Safety Administration says. The average age of the children who died in 2018 was just 21 months. Half were left unattended by a parent or caregiver who forgot that they were in the car, the traffic safety agency says, while in 27 percent of the cases the child found their way into the vehicles by themselves and became locked in. In 17 percent of the cases the child was left in the car intentionally by adults who assumed that it was safe to do so. Two decades ago this phenomenon was rare, but all that changed in the early 1990s when safety experts recommended that child seats be moved to the back of the car and that infant seats be turned to face the rear to prevent injury or death when passenger-side front airbags deploy. Even with so many advances in vehicle safety, children should never be left unattended inside a car, Steven VanNorman, medical director for Intermountain Dixie Regional Medical Center, said in a statement to St. George News. “Temperatures can quickly become life-threatening, climbing to 130-170 degrees in a matter of minutes when the outside temperature is 80 degrees or greater,” VanNorman added. To illustrate how the inside of the car can become literally as hot as an oven, the Utah DPS will host a demonstration as part of the department’s 2019 Family Safety Fair on June 20 in Taylorsville, in which chocolate chip cookies will be baked using only the heat radiating into the car. 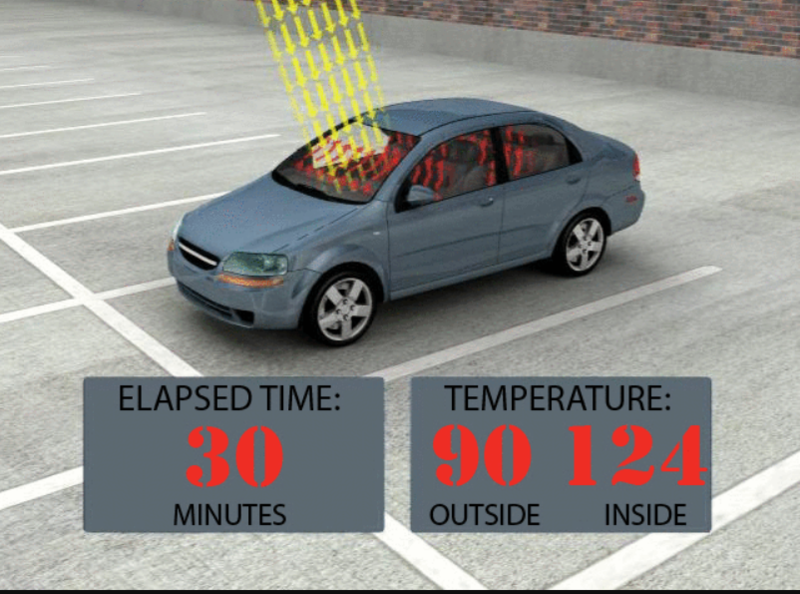 Vehicle heatstroke begins when the core body temperature reaches about 104 degrees and the system that regulates temperature is overwhelmed, at which point vital organ function begins to shut down. A core body temperature of about 107 degrees is lethal. 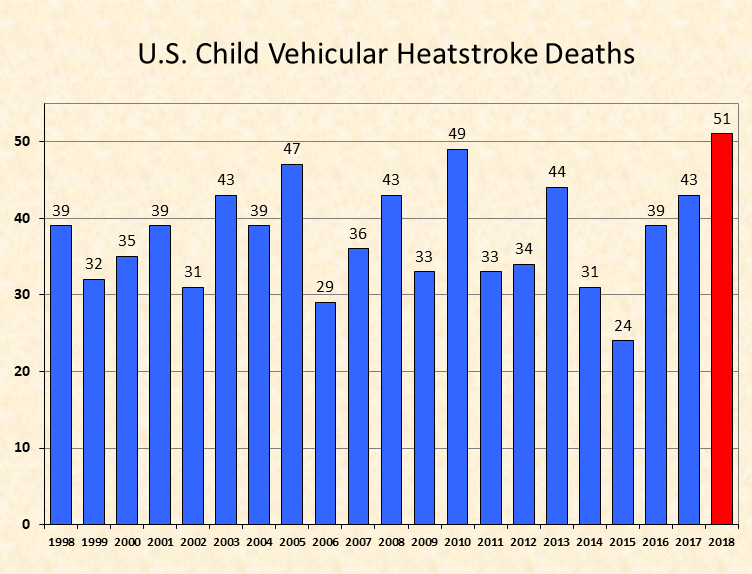 Understanding why children are more vulnerable to heatstroke than adults is vital because a child’s body heats up three to five times faster than an adult’s, according to the National Highway Transportation Safety Administration. A body, especially a small body, can go into shock quickly, and circulation to vital organs can fail. The body is cooled by sweating, but that only works when there is an air current that is virtually nonexistent inside a parked vehicle. Making matters worse, a child’s sweat glands develop with age, so the younger the child the less developed they are. 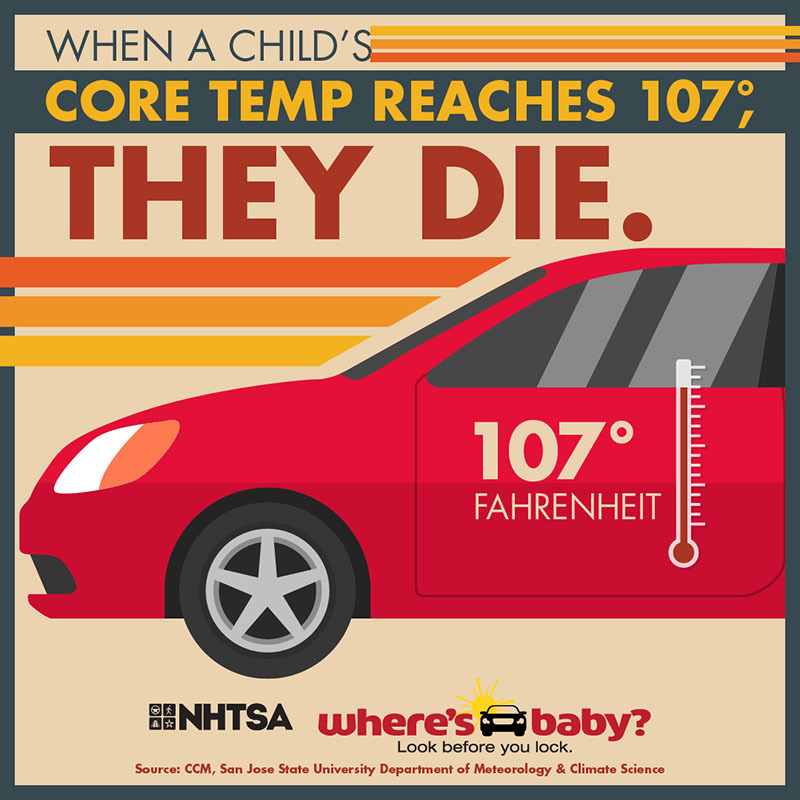 Further, the heat inside of a vehicle can rise so rapidly that it overwhelms a child’s ability to regulate his or her internal temperature, made even more difficult for younger children as they have underdeveloped sweat glands. When a child is left in a car, they begin sweating until they have no more body fluids left, which is when the blood pressure drops and their heart can give out. According to Johnn Trautwein, director of the pediatric emergency room at Summerlin Hospital Medical Center who was cited in the Las Vegas Review Journal in May 2015, at this point, they begin to have brain events, seizures or go into a coma. “It can happen very quickly,” Trautwein said. Even great parents can forget a child in the back seat, according to the National Highway Traffic Safety Administration. This issue has been studied for more than a decade by University of South Florida Psychology Professor David Diamond, who in his latest publication describes the psychological and neurological factors that can cause responsible people to make such fatal errors. Diamond explained how the brain can fail to remember to do something in the future, which is a prospective memory, such as remembering to call a friend after lunch or to stop at the store on the way home from work. According to Diamond, humans tend to go into autopilot mode when completing habitual tasks, such as getting ready for work or driving directly to the office on a typical day. The brain goes through the tasks on a well-traveled route, which can cause a parent to lose awareness of the child in the car. Extensive research has shown that the completion of a task can fail in a matter of seconds when competing factors come into play, such as a phone call, a sudden change of routine, stress or sleep deprivation. “These tragedies generally occur because of a distraction or change in routine,” VanNorman said. This phenomenon may have played a role during a 2017 incident in the Winchester Hills subdivision just north of St. George where a 2-year-old boy died after being left in a vehicle for approximately six hours. The incident took place during a family reunion that included more than five families and 25 to 30 children. In that case deputies determined the child had fallen asleep during the return trip and did not exit the vehicle with the other children and adults. The child was discovered later by his father. In Utah, it is illegal to leave a child under the age of 9 unaccompanied if there is a risk of hyperthermia, hypothermia or dehydration. Utah is one of 20 states with unattended child laws and one of only 10 states that protect those who see a child in a car and take action to render assistance. Many deputies in Iron County deal with an opposite problem, which is when children are left inside of a car in freezing or frigid temperatures. “Either way it can be very dangerous because children aren’t able to regulate their body temperature as well as an adult,” he said. What should you do if you see a child in a hot car? Don’t wait for the driver to return – call 911 right away. The 911 operator can provide instructions on how to care for the child. If the child is not responsive or is in distress, immediately get the child out of the car by any means necessary and move them to a cooler environment. Remove the child’s clothing to let the heat dissipate from their skin while using cool water or wet rags to dampen the child. If the child is unresponsive, stay with her until help arrives and ask someone if they can locate the driver. It is never OK to leave a child alone in or around a car for any reason. Take this quiz to test how much you know about preventing child heatstroke. Heatstroke does not only occur during summer or in hot weather, it can occur at any time of year, in any weather condition, in any community – for any parent.